A couple weeks ago I built and installed this mantle in a neighbors condo. I've had experience with the gas fireplaces in these condos so was concerned about overheating of the mantle head directly above the firebox. My solution was to use Hardie Trimboard and their 3 1/2" crown. This gave me a fireproof (but not fire rated as Hardie products transfer heat) mantle head. The vertical side legs are made of poplar. All materials meet the required firebox setbacks.......whether wood or cement board. I spoke with both Benjamin Moore and Sherwin Williams tech support and found that most latex paints are rated to 200°F before failure. I was also told that above that they could fail but would not ignite. Has anyone else worked with Hardie or other brands of cement board for architectural detail work? Oh.........I neglected to make one point I wanted feedback on as well. I ended up using the best Benjamin Moore latex for the top coat. It was way too thin and runs while brushing it on were a significant issue. Then when it dried I had an extremely rough surface which you can see if you click on the image and blow it up. Next time I'm at their place I'll be sanding it out and trying to get a cleaner surface. I think both the rough surface texture of the Hardie Trimboard as well as the issues with the paint caused this poor finish. Since it is obviously not the real Bernie that would try to make a mantel out of hardiplank, I can speak with freedom. And Why? Is it that the Hardiplank will not catch fire, despite the fact that the images are not code compliant? Is it that this ultra valuable design will survive, even if the rest of the structure is gone? This is about the ugliest fireplace/mantel thing I have ever seen. The excessive drive to economy has limited the brick to a minimum that looks like Wal-mart at its worst. Things apparently must now be made so cheaply as to no longer perform the function that were designed for. That all happened before the alleged Bernie got there. There are nice, easy rules and guidelines to fireplace design that have been around for hundreds of years. Code requires 10" from the top of opening to combustible. More with projection. Good design (as found in the Wallace Nuttig books and others) can easily be found and adapted to the current situation. Is it because no one wants to 'spend money' on the fireplace? Is it that no one cares or even knows what they look like? If we cannot produce well-designed and well built architectural woodwork, what good are we? If the best we can do - fake Bernie and others - is what we see in that photo, then we might as well all go home and get ready for flipping burgers. If we cannot make attractive architectural details that reflect the evolutionary designs of the past while carrying it forward to the future, we should go to work in the Hardiplank factory. 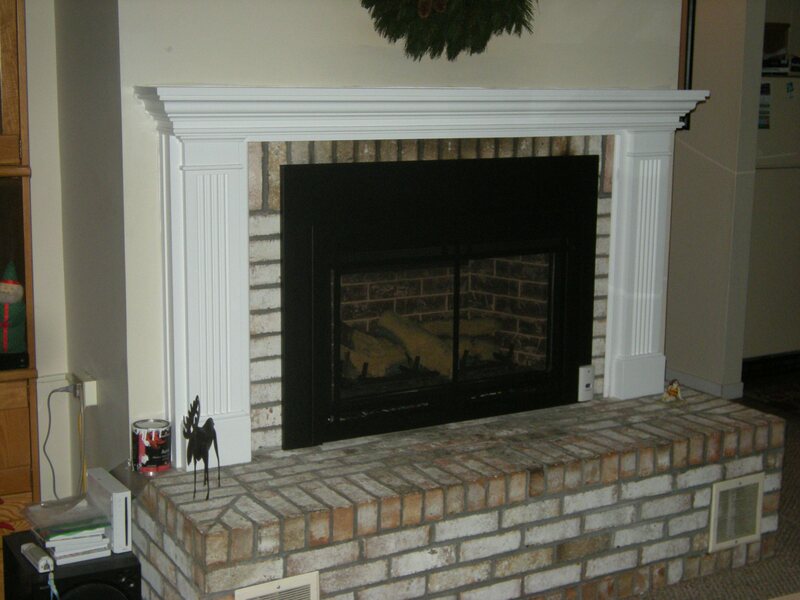 And you are absolutely right about that fireplace design; it is just about gag me ugly. There are 24 of these in the complex which was built by a company with somewhat less than a stellar reputation. I put a 100% wood mantle in another one of these units and it got so hot I had to have the gas fireplace installer come in, remove the gas unit and insulate the original wood firebox. That helped a lot. The problem is primarily the design of the gas insert units that have their circulation fans blowing into the top rail of the screen/grill door instead of through the screening. Very poor design. If it were not for those gas units a wood mantle would be fine. 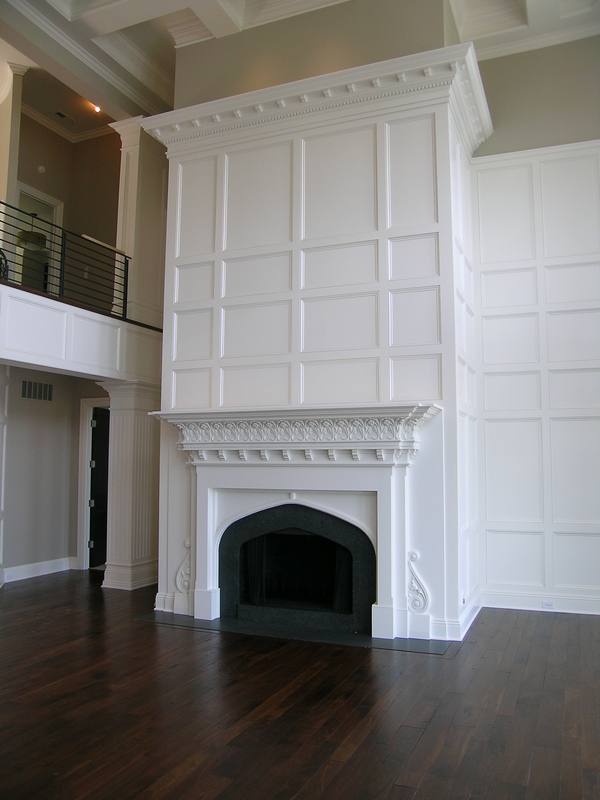 I thought the use of the Hardie Trimboard was a clever idea when suggested to me by the gas fireplace dealer. It was certainly worth a try. As you well know a simple mantle like that........even made in cement board.......doesn't take long to build and install. It was a favor for a neighbor so money was not an issue. The mantle does meet the 10" setback from the gas insert firebox and then some. That has a metal black surround though to fill the oversized gap of the original wood fireplace which makes it look like it does not meet the requirement. I'd post a photo of the mantle I built for the other unit, which is a little more artistic so to speak, but I don't know if my ego could stand another bashing........LOL. 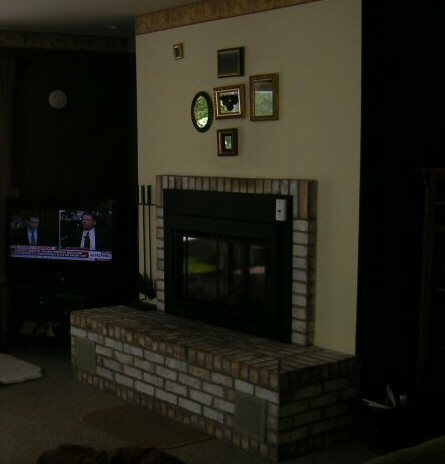 Here's what these fireplaces look like as built in the 80's. While David Sochar makes some good aesthetic and practical points, there are situations where sometimes one confronts the reality of less than stellar construction methods, and millwork being one of the last things to go in, the collective shoddiness of construction methods makes for a less than optimal millwork environment, and thus limits one's aesthetic and practical choices. While Hardiboard speaks to a certain level of desperation, I wonder if you might consider plaster moldings and architectural elements as an alternative. 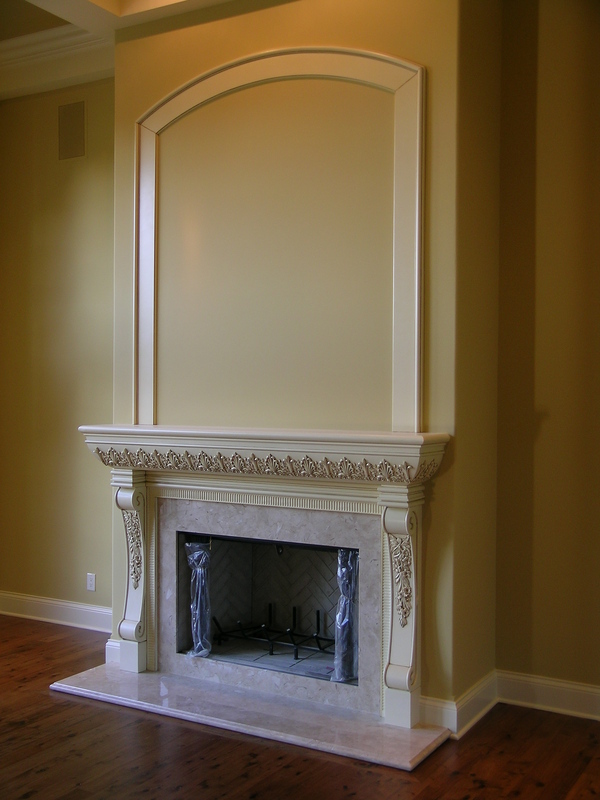 Most plaster components have a Class A fire rating, and are generally manufactured in patterns that reflect an architecturally correct style. And it has to paint more easily than Hardiboard. DecoCraft comes to mind, I imagine there are others. The question is.... where is the real Bernie, locked in a soundproof basement somewhere? I hope not. But to the impostor, that seems a reasonable solution and within the limitations of the situation pretty good looking. Not sure on the paint. I guess time will tell! That is a great idea and I wish I'd thought of it. I went to the site and it looks like a far better solution to the cement board products. As to "my real name" I'll only say that I've been lurking around Woodweb since just about the beginning and believe many of the people here know me as either BH or Bernie. And I guess now is as good a time as any to officially state what many already know. I sold BH Davis Company in the spring of 2016 and retired a year later. The curved mouldings are still being made by my same crew of craftsmen under leadership of the new owner whom I've known since he was a child over 40 years ago. So I'm still out here and enjoying retirement while using my newly setup home shop. I had to go out and purchase enough machines to do this as a life time's collection of tools and machinery went with the sale of the business. So while I'm no longer associated with B.H. Davis Company I do totally and completely remain B.H. Davis..........BH to my close friends.